So I have been staying at Little Paradise on the top of Kot Danda, for the last few weeks and I cannot leave here without writing about Man Prasad, the owner of Little Paradise (pronounced Mon as in the French “mon ami”). Mon Prasad does not talk much, but he occasionally bursts into animated discussion if you take the time to stop and listen. Most of what I have learnt about him is from his son and others. He was described to me by someone who should know better, as the old man who sits in the corner and does nothing. Nothing could be further from the truth. He gained difficult competitive entry to the British army with the Gurkhas as a young man, leaving the after completing seven years. Leaving the Gurkhas is rare as in Nepal as it is an excellent career, well paid with a good pension at the end. Man Prasad chose another route and joined a British project in the east of Nepal, training to become a vet. A further ten years, he returned to the Pokhara area and joined Lumle Agricultural Centre, focusing on animal husbandry for several years. In the late 90’s with the local villagers asking for his help, he finally returned to the Ghandruk area, bought the land on top of Kot Danda and started building Little Paradise. To the trekkers who pass through, he is the old man pottering amongst the chickens, woodpile, vegetable patch, but investigate further and you soon learn how important he is to the community. For starters, he is currently in the middle of a project to bring electricity to four local villages (about 350 houses, spread across some steep and difficult terrain). He has organised the four communities to invest in building a hydro electric plant based in Tatapani. Man Prasad has managed the tendering process with the engineering company who will build the actual plant. 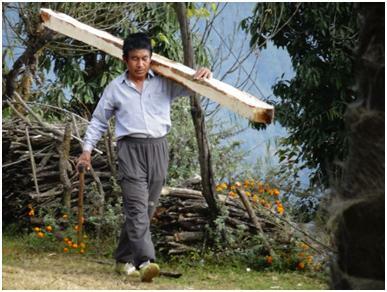 Then he has organised the laying of the line and carrying the steel poles that will carry the electricity lines. They are heavy and large! Each house is allocated a number to carry in, either by themselves or they pay a porter to get them in. Then there is digging more trenches etc etc. A low interest loan has been taken from the bank and it is anticipated once it is paid back in about 4 years, that the communities will have free electricity. The electricity will not be monitored for useage, but each home pays according to their type i.e. a farm will only pay NPR200 a month, a homestay with trekkers NPR500 per month (NPR 95 = US$ 1). Secondly, although only with veterinary training, he serves as the only doctor to the surrounding communities. 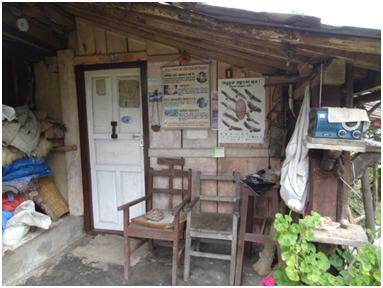 He practices both western and ayurvedic medicine from a small room attached to the house. If he cannot treat beyond his limited facilities he sends his patients to the hospital in Pokhara. Often he treats people for free even when they offer to pay, or they bring food in exchange. His stock of medicine is limited but covers most of the illness, flu, ulcers, breaks, dog bites, injuries etc experienced by the locals. He buys his own stock of medicine and antibiotics, with no help from the health authorities. One night we were pretty much wrapped up and quiet, when 8 people arrived from the village; they had come to Man Prasad and were waiting for the arrival of a woman being carried up from the other side of the hill by another group of people. In total 15 villages had come out on a cold night to assist a woman with serious stomach pains and vomiting. In the end the diagnosis was that she needed hospital and food was prepared for everyone for the long trek down the mountain at night. Thirdly, he has introduced a number of new crops to the area. The most recent being tea plantations. He has grown and produces tea at Kot Danda for a number of years and is now advising the villagers in Uri and helping set up a new tea plantation. Already the terraces have been fenced off from buffalo and tea plants planted. It is a long term investment for the future, but one that everyone has committed to. Little Paradise itself is pretty much organic and they grow long list of crops here including corn, barley, buckwheat, millet, potatoes (on a rotational basis), tomatoes, lettuce, carrots, spinach, pakchoi, chilli peppers, garlic, red and white cabbage, marrows and a selection of fruit – plums, passion fruit, apples and peaches. Their two cows produce milk, butter and ghee and a number of chickens keep the pot full on a regular basis. For his wife he has built a luxury kitchen. More on that later. I keep learning more about Man Prasad and am sure there is much more untold. If you have come across the blog looking at Himalayan trekking in the Annapurna Sanctuary, then you can find Little Paradise about an hour and half’s climb beyond Ghandruk, take a right turn off the main trekking trail as you reach Komrong. Another 45 minutes and you will find a warm welcome from Man Prasad, Mina and his son Manoj.